It’s not a secret that LinkedIn is fiercely taking over the business-to-business market in the social media game. With over 500 million professionals using LinkedIn and around 106 million monthly LinkedIn visitors logging in every month, it is seriously dominating the social media market for businesses. Since Facebook has been in bad press for a while now, LinkedIn has swooped in for the kill and we believe that it is swiftly becoming one of the best places for businesses to be seen. Rolling out improvements on their campaign manager is evidence that they know it too and want that top space. What is advertising currently like on LinkedIn? Sponsored content: This is like boosting a post on Facebook. You start out by posting an organic post to your followers. You can then use a monetary value to push this organic post out further to your targeted audience so it shows up in their feed as “sponsored content”. Text Ad: This is like a single image ad on Facebook. 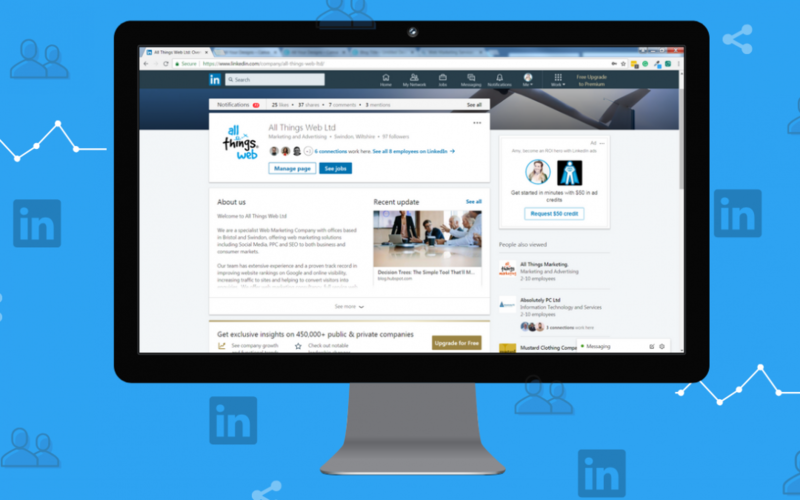 These will show on the right-hand side or top of your audiences desktop feed on LinkedIn. Sponsored InMail: This sends personalised messages to those you choose to target on LinkedIn. What is a Carousel Ad? In recent news, we have seen LinkedIn rolling out carousel ads in a bid to make the social media platform more ‘humanised’ and interactive. The new type of ad called a carousel ad. For those that use Facebook advertising, it is similar to the carousel ad format there. In these types of ads, you can add up to 10 customised, swipeable cards. When your audience sees it, they may be inclined to swipe and interact through the images to take a look before clicking on the ad. This is encouraging people to be more interactive with your ad before making the decision whether to click through. Marketing Tech News states that of the 300 conducted beta trials so far including Hewlett-Packard Enterprise, RBC and Volvo Canada, around 75% have seen improved engagement and higher click-through rates. LinkedIn ranks the highest for lead generation among other social networks with over 500 million professionals so it’s not surprising that LinkedIn is now dominating the business-to-business market. We offer both social media management as a service and social media training to help you get on top of your social media game whether that’s through upskilling your in-house team or outsourcing it to the experts. If you’d like to speak to us about any of our social media services, give us a call on 01793 766040.